Are leaders born or made?- Well, both! Some fortunate souls are born with an innate ability to lead, but most of us learn it through experiences and opportunities. Inspiration always grows within us. Of course, the seeds are planted during childhood, when we try to model ourselves after our parents, our favorite sports stars, authors, teachers, and professors. But this is not specific to good leaders. Every individual goes through this process, though only a few efficiently put it into practice in their future lives as well. 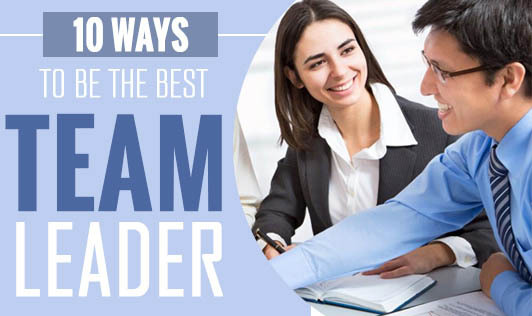 So are you looking to be a great team leader? It includes some general philosophy and a set of practices every leader should be aware of. To begin with, try to be a servant leader. Put others needs ahead of yours. Guide and encourage people appropriately. As a leader it is not sufficient to only explain about the task needed to be achieved. You also need to explain how it can be achieved. Paint a vision for your team. Show them what you plan to achieve and the milestones you need to cross. Be SMART (specific, achievable, measurable, relevant, and time-bound) when doing it and set practical and achievable targets. This specific style of business management requires you to wander around your office space- not aimlessly though. Your workforce is important and with good observation skills you can learn a lot from them, and maybe even pick up pointers just by watching and listening closely. Such action also invites open discussions. Cheering for small achievements can help bring in a lot of positive energy into the team. It creates a certain type of camaraderie amongst your team members and instills positive thinking in them. Practice this every day. A few words of encouragement towards your employees will pay off in a big way in the future. Learn to recognize hard working employees from the start and also know each individual’s strengths and weaknesses. Personal interest in your team member’s work and timely motivation helps them achieve more. We have all heard of this saying. Now it’s time to put it into practice. Regardless of what the problem may be or who caused it, take the blame for your team; always! Bring up the issue only when you are alone with your team and get it sorted as quickly as possible. Get into action with your team and put in some hard work too. This is the best form of motivation you can provide for your team members. When they see you work hard, they will be inspired to do the same. If you need good results and if you need them quick, know how to identify the slackers, and get them off your team as fast as you can. Lazy co-workers only make it tougher for the rest of the team. Do what you say you will do! In other words, practice what you preach. Be a role model for your team members. When they see you being so enthusiastic and hard working, they will be encouraged to do so too. Work should not be taxing; it should be fun. Incorporate a fun activity for your team at the end of each busy day. Solve brain teasers, riddles, and have brainstorming sessions. Make them group activities, so it gives a chance for people to interact.